The Formilla REST API provides the ability to push customer data from your system to Formilla. By pushing your data into Formilla, you can send automatic email and in-app messages to your customers based on any custom data important to your business. This post will give you an overview about how to use the REST API, with examples on how to create or update your contact data, what API response codes to expect, and more. Note: if you’re using Formilla with a Wix website, the Formilla REST API is not supported. The Formilla API is RESTful and responds with standard HTTP response codes to indicate the result of the request. It is disabled by default in your Formilla account, so you can start by enabling it with the steps in this post. When you enable the REST API from the Security page, a Token will be generated for your account. 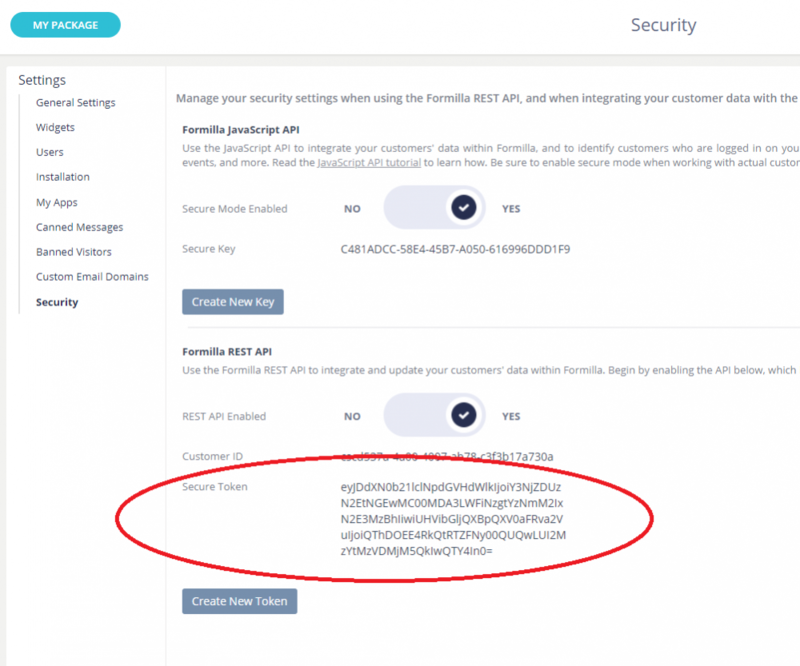 Each request you make to the Formilla API must include the token in the request header. formilla_auth_token String The Secure Token for your account. Note: of course, be sure to keep your API Token a secret and do not share it with anyone! Use this method to create a new contact or to update an existing one. UserId String A unique identifier for the contact. It’s required if Email isn’t provided. Email String The contact’s email address. It’s required if UserId isn’t provided. FirstName String The contact’s first name. LastName String The contact’s last name. Phone String The contact’s phone number. SignedUp_date Date (unix timestamp) The datetime when the contact signed up in unix timestamp format. CustomAttributes JSON Object that contains key/value pairs. Use this parameter to pass any custom data you want to track about your contacts. If UserId and Email aren’t provided, no action will be performed by the API. If UserId and Email are both provided, we’ll try to first find an existing contact by UserId and if it’s not found, we’ll try by Email. If we can’t find it either, a new contact will be created. When an existing contact is found, their data will be overwritten with the new data supplied via the API. Check out the following C# example where a new contact is created in Formilla. Please note that the RestSharp library is used in this example. // Contact was added successfully! As you may have noticed, this example returns a 200 OK response if the contact is created successfully. See the full list of responses at the bottom of this post. Remember, you can find your contacts in your Formilla account by clicking Contacts from the left menu. 200 OK – the request has succeeded. 403 Forbidden – unauthorized request due to an invalid formilla_auth_token or you’ve exceeded your current package limit of contacts. 404 Not Found – the requested resource was not found. 429 You have reached the REST API max limit. Message: API max limit has been reached. Please limit requests to 40 per 5 seconds. 502 Server Error – likely something went wrong on Formilla’s end. 503 Service Unavailable – API is temporarily unavailable due to scheduled maintenance.